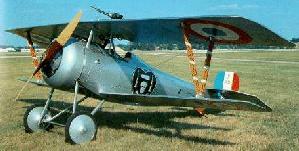 The Nieuport 17 was one of the classic fighters of World War I. The Nie. 17 was a direct development of and marked improvement over the Nie. 11 "B�b�". It had a more powerful engine, larger wings and a stiffening of the entire structure. It first had the 110 hp Le Rhone 9J rotary engine, and then was upgraded to the 130 hp Clerget 9B. The Ni. 17 combined outstanding maneuverability with good speed forward and climbing. Its major defect was the lack of rigidity in the lower wing under heavy loads. The good manoueverability of the craft extended it's useful service life past what it would normally have had. It reached the French front in March 1916, about the same time the British introduced the D.H. 2., and was adopted by the Royal Flying Corps and the Royal Naval Air Service because of its superiority to any British-designed aircraft then in service. Nieuport 17s also served with the Dutch, Belgian, Russian, and Italian air forces. Italy built 150 under licence, and Germany was so impressed it manufactured a copy, the Siemens-Schukert D3. Six RFC squadrons and eight RNAS squadrons used the Nieuport 17. Even though its lower wing could twist off in high speed dives, the Nieuport became the favorite of the leading allied air aces. The Canadian ace, W.A. "Billy" Bishop, was awarded the Victoria Cross for heroic exploits while flying a Nieuport 17. Many aces flew these aircraft, including: Ren� Fonck, Georges Guynemer, Charles Nungesser, Albert Ball and Billy Bishop. It had fine flying characteristics and influenced the design of many other aircraft, the German Siemens-Schukert D3 was a direct copy of it, except for the tailplane. Charles Nungesser of the French L'Armee de l"Air.